It would be facetious for me to call this a museum. Donald Trump dropped the “Mother of all bombs” on Afghanistan on April 14, 2017. The next day, April 15, 2017, North Korea made a show of force in an incredible parade of thousands, weapons a long way from akimbo. I was struck by the soldiers marching. On February 9, 2017, the World Atlas tells us that these are the largest armies in the world. 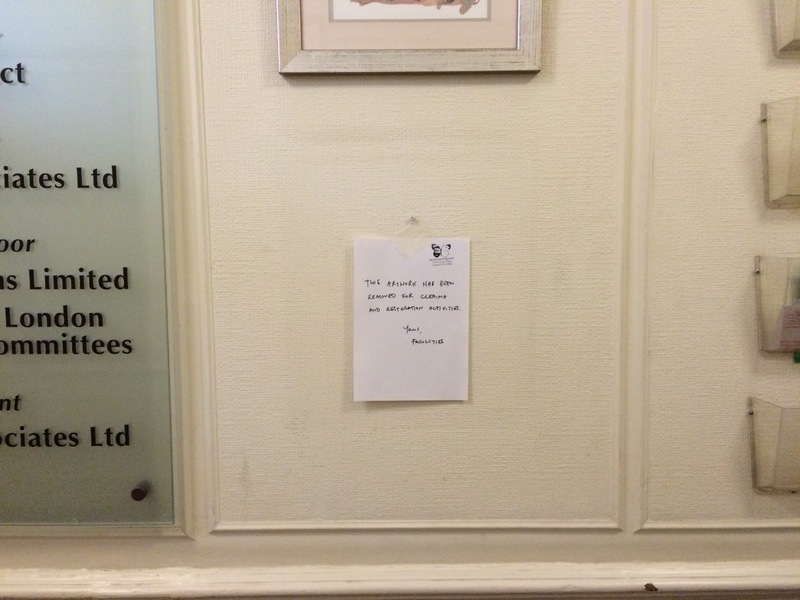 There’s a small chance my landlord may read this, so let me start by saying this is an act of love and respect. 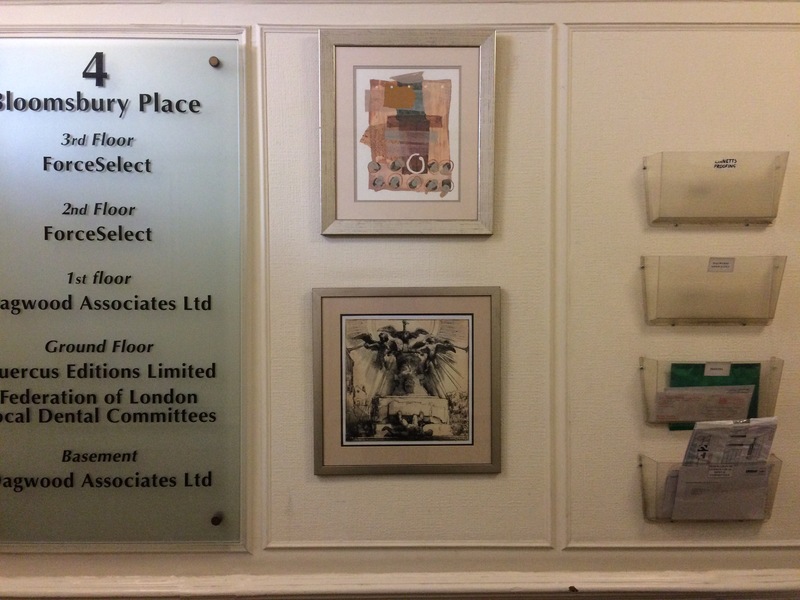 Last week, I was very excited to choose a Rembrandt work from the list of things acquired by the British Museum for Hans Sloane to hang as our first work in the foyer at 4 Bloomsbury Place. 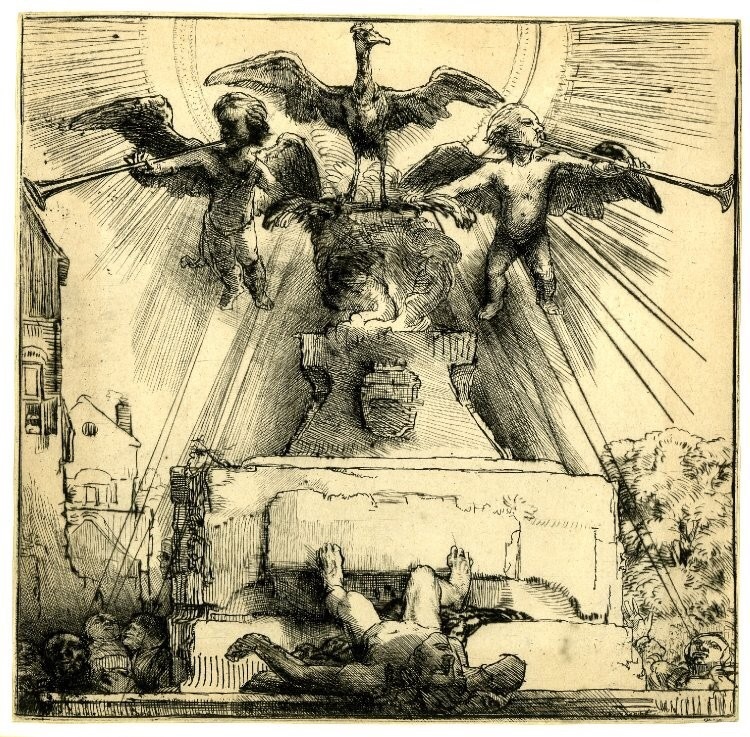 It’s an etching made in 1658 called The Phoenix or The Statue Overthrown, which seems apt as well as beautiful. I had asked the BM’s permission to use (and download) it via the usual channels. I enlarged it slightly to fit the frame that was already there, and installed it last Thursday. We had the world’s tiniest opening party — with applause! 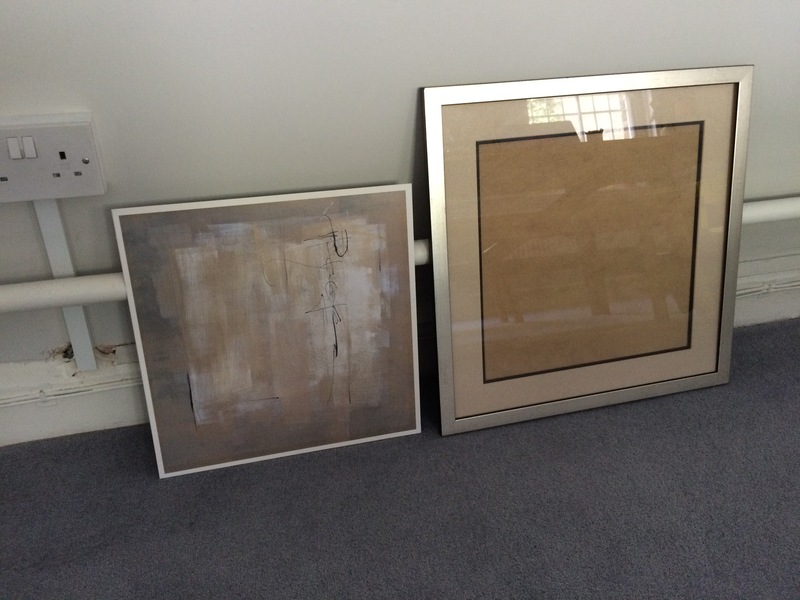 — and thank you to Tom for helping with the framing. Today I’ll be at the Mozilla Festival, part of a thread called BBC HomeLab Kitchen, run by Alexandra Deschamps-Sonsino and Peter Bihr. There’s more to look at about the thread at thegoodhome.org. Ostensibly, the thread is about tech and the home, how the Internet of Things could impact the home, some future casting about “a new vision for the home in the 21st century”. Alex asked me to stage a “last minute museum” to round out the weekend, so I attended yesterday, and look forward to today. I’ve already begun collecting some artefacts of the event itself, but am also interested in the theme Alex cracked open yesterday in her Q&A with Rocio Rodtjer, of Women As Audience of Kitchen Tech. This morning’s session – She’s in the kitchen: Why women should contribute to smart kitchen development – should be interesting too. Rodtjer’s point that the kitchen is a public space has got me thinking of all my Kate Millett and Gloria Steinem again. I can’t stop thinking about how women are portrayed in kitchen-related infomercials. Clearly hopeless, forgetting how to use a draw full of utensils, thank god for Gadget Wizard, etc. A copy of the IoT Design Manifesto V1. Wondering if it’s appropriate for a museum to suggest an update. I’m exploring how to manipulate the audience. I guess this is The Small Museum V2! I’ve been trying to find examples of Asian museums doing open data-y work because I’m giving a keynote at Museums and The Web Asia in Melbourne this year, and want to build some background. (If you know of any, please let me know!) There I was, futzing about looking over Google results for “china open access museum”. Sort of a ludicrous search in some ways, but, it helped me find the amazing Museological Review, a journal out of the University of Leicester. I’m embarrassed to say I hadn’t heard of. I’m sure you have. If you haven’t, go and read it immediately. 1. The creation of new museums in Estonia was connected to the emerging national identity. 2. Small museums are special because they allow personal contact. The presentation of one’s personal worldview is a good starting point for making contact with a visitor. In DIY museums the head of the museum, curator, collection manager, guide and warden is often the same person. As real enthusiasts, they love explaining how their exhibitions are compiled, how their museum functions and telling additional stories about the exhibition. It’s possibly unnatural how well this essay is resonating with me. It’s exciting to gradually discover the academic and intellectual thinking about what museum means, and a lot of the points she raises about utopian thinking, art and museum sit in the centre of what I want to be making. Museums are important here, first, because those with long histories and old collections are in a good position to illuminate the history of “how intellectual work is saturated with moral, emotional and aesthetic elements at a collective, and not just biographical level.” Museums are not only instruments for the shaping of sensibility, as Tony Bennett and others have argued, but also their collections hold within them a history of sensibilities, their rise, demise, and potential for recuperation. How might an older constellation of wonder, curiosity, and intense attention animate the museum as a contemporary utopian laboratory? This is an invitation to find the utopian potential of the museum not only in the achievements of the past, but also in its history as a materialized subjunctive space. It is in the museum’s capacity to provoke and sustain speculation, reflection, retrospection, prospection, whether reasoned or dreamed, that its utopian possibilities lie. 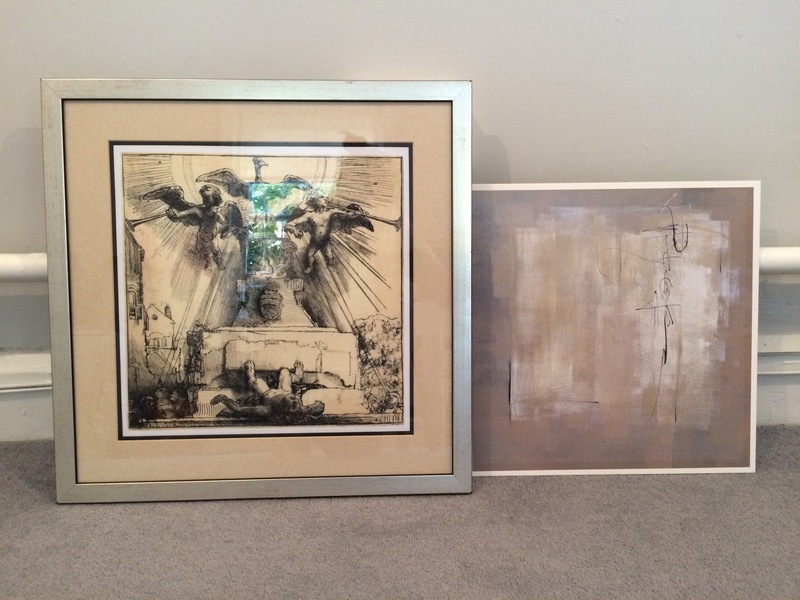 I feel like I need to find a home for this work, a place. I’m working on it. How does the museum, despite its best efforts to create certainty, produce unpredictability? Through fragmentation, aggregration, selection, juxtaposition, connection, contrast, excess, and confusion. Now I’m off to read another of her essays, From Ethnology to Heritage: The Role of the Museum (PDF).